I often wondered how come only mobile devices get the "speed up" and "optimize" buttons on these kind of apps. I mean, wouldn't it be great if I would have a "Turbo" button that once pressed, your computer would go from lard mode to being super optimized and ready to perform better? There was a time though when such a button existed physically, but times have changed and so did computer processors. Nonetheless, there are quite a few things that can be done to an operating system to make a computer perform better without overclocking the CPU. Installing Advance SystemCare is one of them. The Turbo Button is back! Advanced SystemCare 8 (not a typo) is a an system optimization control center that reunites many tweak options that only windows savvy would know into an accessible package. There are quite a couple of impressive features to talk about. So let's get started. The Care Scan performs a search for spyware, registry errors and junk files among others. After a scan you can select to repair issues in bulk or alternatively you can check a box to repair them automatically during the scan. Similarly to CCleaner Advance SystemCare checks your browsers for security issues and clears their cache. The fixing extends to downloading security updates from Microsoft. Protect is a list of switches that handle different browsing security and general system security aspects. For example, it can freeze your homepage address and default search engine so that they would not be changed by third party plugins or programs. System Reinforce plugs up security weaknesses to make it harder for hackers to gain access. It also displays a list of vulnerabilities that you may decide to fix or keep. The Toolbox is a collection of programs and add-ons that do not come with the base package but need to be downloaded before use. Don't worry, they download as soon as you first click on them. I would especially give attention to IObit Uninstaller and Start Menu 8. These two make life much easier as far as I'm concerned. Turbo Boost is probably the highlight of this app. It is a tool that shuts down processes that are not really needed depending on your activity, be it running an office application or the latest PC game. Once you set up the desired level of optimization just click on the boost gauge and let Advanced SystemCare do it's work. The settings can be reverted by turning off Turbo Boost when not needed. 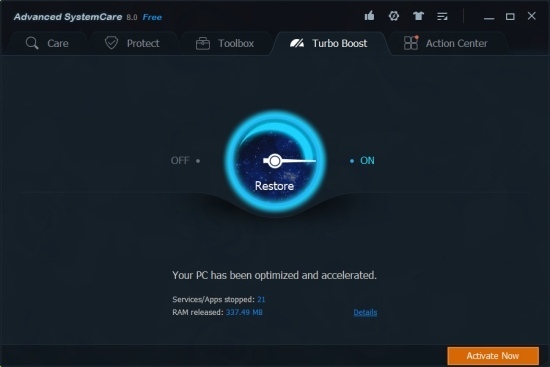 The Turbo Boost gives Advanced SystemCare a good reason to be installed on any PC that needs to be used to it's full potential. Gathers every security and optimization solution from IObit into one app. There are quite a few tools and options that are not accessible in the free version but are still visible and teasing. 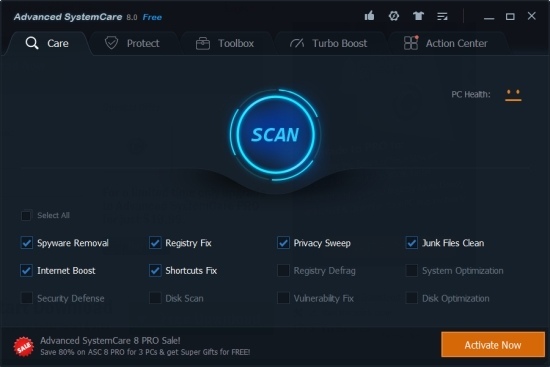 Advanced SystemCare Free is a must have if you have ever enjoyed another tool from IObit. Either way, it doesn't hurt to check how you can benefit from it.